Fifty of Minnesota’s top high school-aged goaltenders, including eight boys and girls who were selected to participate at USA Hockey’s 2017 National Player Development Camps, arrived Thursday at St. Cloud State University’s Herb Brooks National Hockey Center for the 13th annual Minnesota Hockey Dave Peterson Goalie Camp. Steve Carroll, a goalie development coordinator for Minnesota Hockey and USA Hockey, led the four-day program, which aims to improve individual skills, techniques, confidence and consistency among goaltenders between the ages of 15 and 18. In addition to extensive on-ice training, camp attendees also receive thorough off-ice guidance in performance and vision training, nutrition, goalie yoga and hockey opportunities beyond high school, making it a comprehensive learning environment. 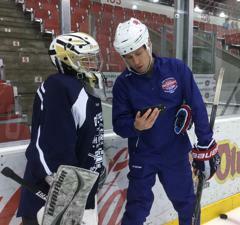 USA Hockey’s Phil Osaer was a camp coach, tutoring attendees and helping lead American Development Model training sessions that mirrored USA Hockey’s annual Warren Strelow Goaltending Camp. Chanhassen’s Olivia Rinzel was among the attendees, and she echoed Osaer’s observations about fun. In fact, it was the first adjective she used to describe the camp, which was the second of two major goaltending development events on her calendar this summer, a slate otherwise filled with tennis, off-ice training and juggling for relaxation – objects in this case, not schedules. Earlier this summer, Rinzel shined at USA Hockey’s Girls 15 National Player Development Camp, stopping all 25 shots she faced during the five-day event. It was Rinzel’s first opportunity to wear a USA jersey and she’s determined not to let it be her last.